The Ranty Highwayman: What A Load Of Bollards! bollards! they are everywhere on our streets, but do we really need so many of them? What are they for? who do they help? who do they hinder? So, what are we talking about? "Bollard" is a catch-all term to describe short posts stuck into the highway. They are made from steel, cast iron, timber, plastic - in fact any half-robust material will do the job. They come in a range of colours and shapes and are ubiquitous on our streets. The idea for this post came a while back when I got an email about a new Traffic Advisory Leaflet; TAL2/13 - Bollards and Pedestrian Movement. 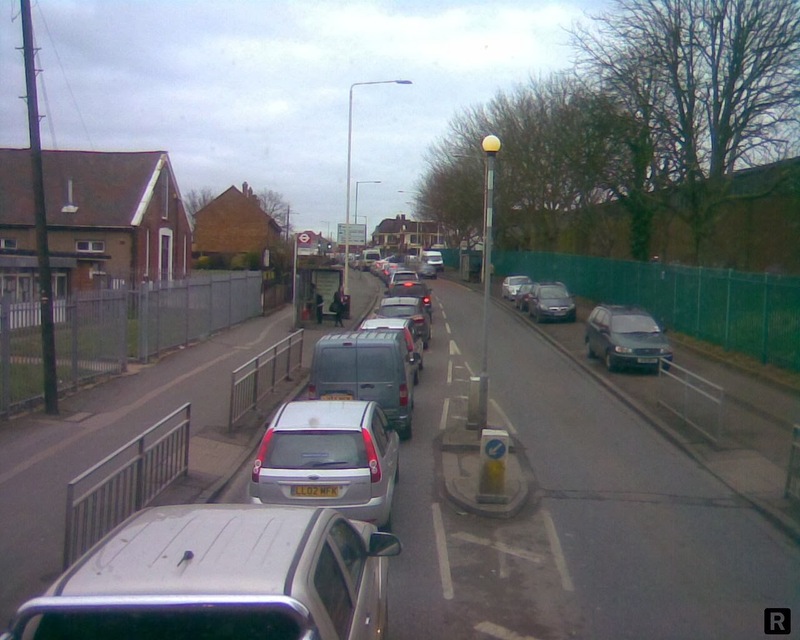 TALs are a series of government advice guides covering all sorts of highways and traffic stuff. Some are good, some are bad and this one is particularly ugly. Coming hot on the heels of TAL1/13 - Reducing Sign Clutter, I thought that at last, something to help argue for a reduction in bollards which clutter the place up for pedestrians (and cyclists!). Oh dear. I was wrong. Civil Engineers. On the right, part of the HMRC complex. TAL2/13 is issued by the DfT and the Centre for the Protection of National Infrastructure. In essence, rather than being a helpful document on the impacts of bollards on pedestrian movement, the document is a narrow study into justifying the use of bollards to prevent vehicle-carried bombs getting close to important buildings and facilities and the earth-shattering conclusion that bollards used for security protection don't impede pedestrians. What a load of bollards! If you go to the Whitehall area of Westminster, you can play the very easy game of "spot the government building". The clue is that they all have large black bollards or sections of wall in front of them (such as Whitehall). These bollards are not just stuck into the ground, they are socketed in huge buried foundations and are of a construction which would stop a pretty large truck bomb from getting through. The science is concerned with the distance between the bomb and the target. A bomb shockwave expands radially, but the energy quickly decays as it travels away from the point of the explosion. Therefore, the further away the bomb can be kept from the target, the lower the impact - in fact, the energy dissipation is nonlinear with distance. So, for every metre travelled between the blast and the target, the energy is far less than the previous metre. The leaflet also explains that in order to meet "security requirements", the "air gap" between the bollards (the empty space between them ) needs to be 1.2 metres as a maximum. The findings of observation and literature reviews suggest that with this gap, there is a "minor effect on pedestrian convenience". Yeah, right. There is counter-position to all of this security in that a would-be terrorist won't bother trying to attack a fortified location, he would go for a "soft target" anyway. So, on the off-chance that a government building might be attacked, pedestrians have to put up with reduced footway widths, bollards in the middle of pedestrian crossings and obstructions to their free movement. Oh, I also think that these phalanxes of bollards look awful and I wouldn't like to clip them riding a cycle or motorbike. been enough, but they double up as sign posts. Bollards can be useful in situations where unauthorised or undesirable vehicular access needs to be prevented. 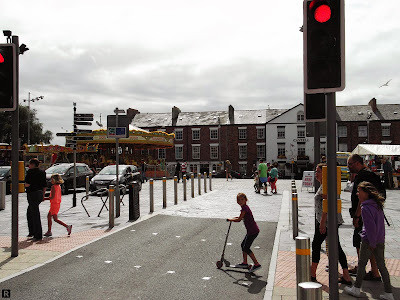 A good use is on those pedestrian and cycle links which can be used to create filtered permeability through an area, but where there is a risk of people trying to drive through the gaps. Thought should be given on the layout and gaps between the bollards as it is very easy to render a nice little cut-through as useless to cyclists, mobility scooter users and people using pushchairs. When being used to prevent access, bollard spacing is critical, although in some cases, it might be best not putting in bollards first and then seeing if unauthorised access is an issue. If being used to stop access to a bridge, then width is important as a vehicle might cause a structural failure. 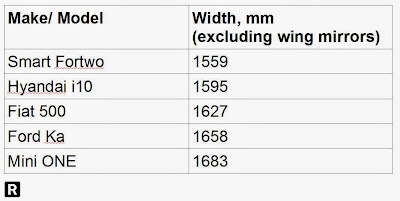 The table gives widths of some popular small cars (excluding wing mirrors as bollards are often lower). I normally design for bollards being installed to leave a gap no smaller than 1500mm to guarantee no access for vehicles, although one can go a little wider in practice as a driver would have to line themselves up perfectly and drive with no errors for a slightly wider gap. 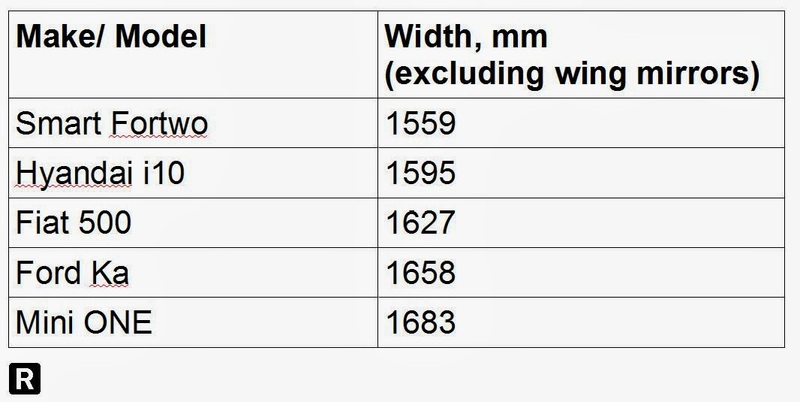 Where designing for cyclists, remember that handlebars on a hybrid or a mountain bike will be around about 750mm across and about 1000mm above the ground and so the gap is important and keeping the bollard lower than the handlebars might be helpful. Do take care that bollards aren't so low as to be missed by pedestrians and cyclists and they will always be an issue for blind and partially-sighted people. Aside from the ant-terrorism use set out earlier, bollards are also used to stop vehicles parking on the footway or to provide separation between traffic and pedestrians. This is an often used treatment to stop vehicles parking on the footway and so there is no need to place them at close centres as one would to prevent access. For most situations, bollards at 5 metre centres will be enough as most drivers in most vehicles will struggle to park between them. If you are that worried, 4 metres centres will be fine. Using bollards this way can stop drivers casually bouncing up onto the footway so go into a shop thus protecting pedestrians, but also prevent the footway being damaged. It is a difficult judgement sometimes as often, a lack of enforcement means that driver behaviour is never challenged and bollards are needed. Of course, in a busy town centre with plenty of enforcement, it might be better (visually) to strengthen the footway by the carriageway edge and accept the odd bit of overrun. Whenever a bollard is used this way, it will be set back from the kerb (to stop it getting hit all the time) and the effective footway width is locally reduced. With the Great George Street example, though, a 500mm piece of footway has been lost all the way along due to the close spacing. 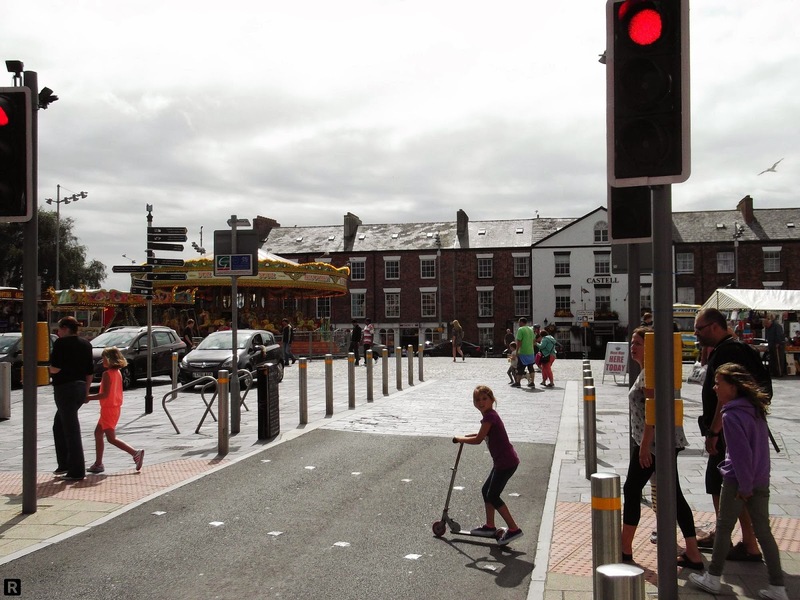 The other option is to use some other street features to do the same job, such as trees, bins, lamp columns and cycle parking hoops. This is the kind of detailing which can take time to get right, but if we use the principal that everything installed on the street should do a proper job, then things will normally work out fine. The last type of bollard I want to cover is the "keep left bollard". Again, seen all over the place, it is a bollard with a circular keep left arrow used to tell drivers (and riders) to pass to the left, not doing so is an offence which risks a £30 fine (not much, I know). They come internally lit, externally lit or reflective and there is various bits of regulation which governs how they are used and how they should be lit. There is no legal requirement that that must be used, just when used, used right. They can be seen at pedestrian refuges, crossings and at traffic islands. They also come in keep right flavours and pass both sides (not very common). Keep right bollards are used wrongly where an island splits cyclists from vehicles. The sign applies to cyclists and in this case they should be blank-faced and probably sensible use of road markings to keep people in the right place. So, there you are. Don't use bollards unless you need to and if you are using them with signs, make sure the signs are correct. It's not rocket science you know! A story I heard while waiting to be served in my local bike shop involved a local superhero triathlete who went for a gentle Sunday ride with his wife and child on his very expensive carbon fibre bicycle. He turned around to yell at his wife while demonstrating his sprinting prowess and failed to spot a bollard in the middle of the bike lane. His expensive carbon fibre bicycle shattered into scores of pieces when he hit hit: he was left with little more than a pile of dust and some mangled metal. The men in the bike shop had a good laugh. Do you have a reference to the law that makes passing a "keep left" bollard on the right an offence? It's something that cars do every now and then on a street we cycle along on the school run, where there are lots of parents and children using the street at the same time. The Traffic Signs Regulations & General Directions 2002 (as amended) sets out what are traffic signs. S10(1) of TSRGD2002 basically lists the signs which apply under S36 RTA1988 and that includes diagram 610. The police can issue a fixed penalty charge of £30 (I think) and there are no points for disobeying a keep left, although the manner of driving to pass on the wrong side may lead to a more serious charge. The sign has to be installed properly and lit in accordance with the rules (some bollards may not need to be lit - it is a bit complicated). Keep left bollards do not need to be placed by law and because we drive in the left, passing on the right of something may still be an offence, but not the disobeying of a sign! Yes, it is not simple to explain! Lovely, thanks! I've done a similar exercise to do with the laws about cycling on a footway. Schedule 2 suggests that the punishment should be "Level 3 on the standard scale. ", disqualification is discretionary, but 3 penalty points are obligatory. I had been wondering for a while if those things had a specific name for them or not. It's really interesting to me that they can potentially be made out of materials that seem flimsy, like plastic. I guess what they are made of isn't as important as the message they give based on where they are placed. My only question is, are the poles with handicap signs on them also considered bollards, or is there a different name for those as well? You would do it with a physical width restriction on either side - 2.13m / 7 ft would a usual dimension - bollards used with signs.